Christine Moo-Young, Kogod/BSBA ’87, and Michael Russell, Kogod/BSBA ’86 in 1988 and 2013. 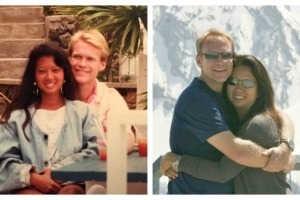 For AU Sweethearts, Christine Moo-Young, Kogod/BSBA ’87, and Michael Russell, Kogod/BSBA ’86, it wasn’t love at first sight but friendship. However, during her junior year and his senior year at AU, that friendship deepened into love. They met as dorm mates in McDowell when Christine was a freshman and Michael a sophomore. “Because we both lived in McDowell, we hung out in the same circle of friends,” commented Christine. Their mutual studies at Kogod and a shared passion for soccer meant they saw each other every day. “We were good friends long before we ever started dating,” added Michael. Born and raised in Jamaica, Christine graduated from a small, all-girls high school and loved being in an academic environment where she felt a part of the community. She wanted to attend a small liberal arts university in or near a city. Upon visiting AU, she immediately liked the size of the school, the diversity on campus, and the business school. “DC was new to me and it had everything a student could want. It was an ideal fit,” she adds. A self-proclaimed “army brat”, Michael was born in Anchorage, Alaska. Over the years, he lived in Florida, Arlington, Virginia, and Australia, eventually returning to Arlington where his dad retired at the Pentagon. Michael decided to attend AU for both its academics and athletics. While at AU, Michael was a member of the only AU soccer team to reach the Division I NCAA finals. His most memorable experience as a student was walking across campus with the men’s soccer team to beat Hartwick College in a 1-0 victory during the 1985 NCAA semifinals at Reeves field. “Banners were hanging from McDowell and Leonard Halls. Students were hanging out the windows screaming and cheering. Hundreds of students surrounded us chanting, singing, and walking with us all the way to field. It was a memory I will never forget,” he exclaims. Christine was also a big soccer fan and attended all of Michael’s home games. After over two years of friendship, they finally had their first date – hiking the trails at Great Falls, Virginia. “I wanted to show Christine a place where I knew she had not seen since living in DC,” says Michael. After dating and graduating from AU, Michael moved to Jamaica when they became engaged in 1989, and they were married there the following year. As time passed, they had two daughters, who each independently decided to attend AU too. Kiera is a 2015 international studies graduate from the School of International Service, and Hailey is a senior majoring in business administration at the Kogod School of Business. Christine and Michael are pleased their two daughters also chose to attend AU. “We did not pressure them to go to AU. They evaluated all the options and made their own decisions to attend. That is why I know they love it here. It was their choice,” says Michael. Currently, Christine and Michael own and manage a small hotel in Jamaica that Christine’s parents built almost 50 years ago. “My mother passed away when I was quite young and my father passed away in 2015, so now I own and manage it with my husband. It has always been a family business,” Christine explains. Even while working seven days a week at their hotel, Christine and Michael still manage to find time to be alumni volunteers for AU. They are both active Alumni Admissions Volunteers and co-chairs of the Legacy Alumni Network. Members of the legacy network include alumni and students who are the children, grandchildren, parents, or grandparents of an American University alumnus/a. Because their daughters attended AU, all four of them are legacies. Christine and Michael both agree that helping to promote AU as alumni is a great way to give back. “We very much appreciate what the alumni association has done for us, and we are very happy to give back in any way we can,” says Christine.